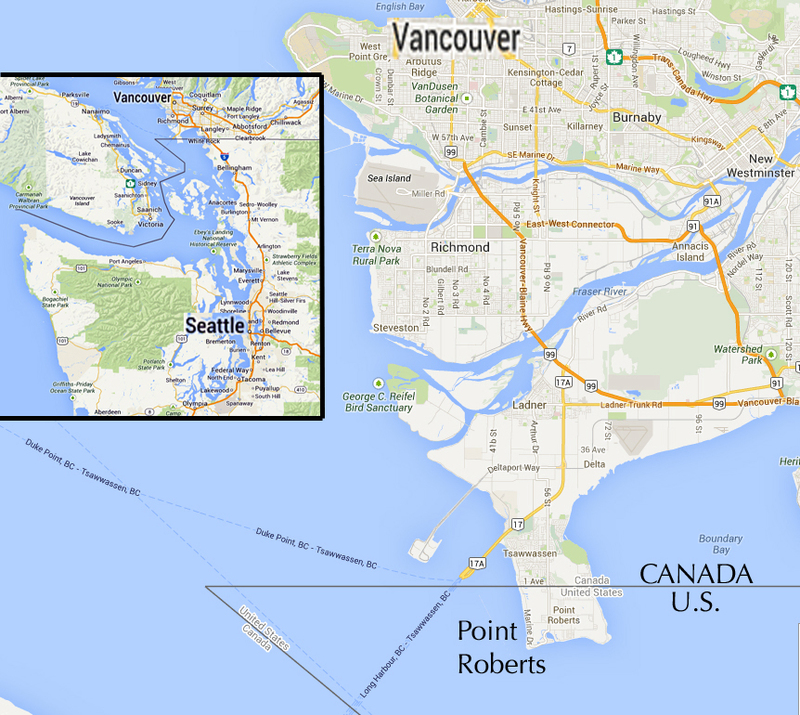 Point Roberts is one of those funny little anomalies you spot on the map and wonder about. It is an exclave — a place that cannot be reached by land without leaving the country to which it belongs. Like the Northwest Angle on Lake of the Woods in Minnesota, that tiny bump in the U.S.-Canadian border. It is a tiny community on the end of a small peninsula that sticks down from British Columbia like a uvula into the Straits of Georgia south of Vancouver. 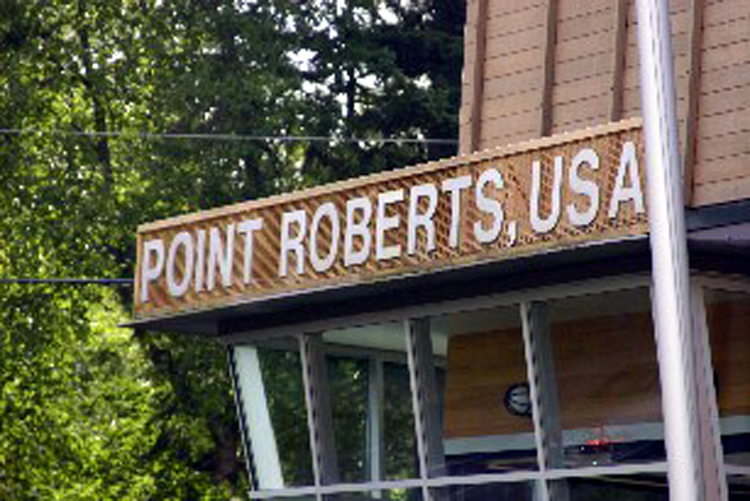 But by a historical oversight, Point Roberts is not in Canada, but in the United States — the county of Whatcom in the state of Washington. When the border between Canada and the United States finally was agreed upon in the 1846 Treaty of Washington — brokered, by the way, by that 19th-century Henry Kissinger, Kaiser Wilhelm I — and the 49th Parallel became the official boundary line, it cut across the Tsawwassen Peninsula, slicing off a teensy 4.9 square miles at its end, leaving the tip accidentally in the United States. Now, Point Roberts might as well be an island. It is surrounded by water on three sides, with the Canadian border on the fourth. It is a 23-mile drive through British Columbia to get from Point Roberts to the rest of Washington. It has made life interesting for the 950 people who live there. For one thing, all electrical power and telephones have to be contracted from Canadian companies; yet when there is a repair problem, American companies are responsible. And when a crime is committed — admittedly not a common occurrence — the miscreant must be helicoptered or boated back to the mainland; he cannot be squired by road through Canada and back into the United States. The police blotter of Point Roberts is worth mentioning. In the four months from August through November, as reported in the All Point Bulletin, the local newspaper, the majority of reports were of three types: drunkenness and drunken driving; trying to cross the border with marijuana; and burglar alarms that went off accidentally. Sometimes a power surge is blamed. There are also a few nasty tales of domestic violence: A daughter got into a fight with her mother and ”knocked a bunch of books off some shelves,” and a girlfriend threw a brush at her boyfriend. But amongst the reports are a few worth quoting whole. So, you see, life is not uneventful in Point Roberts, especially in late September. 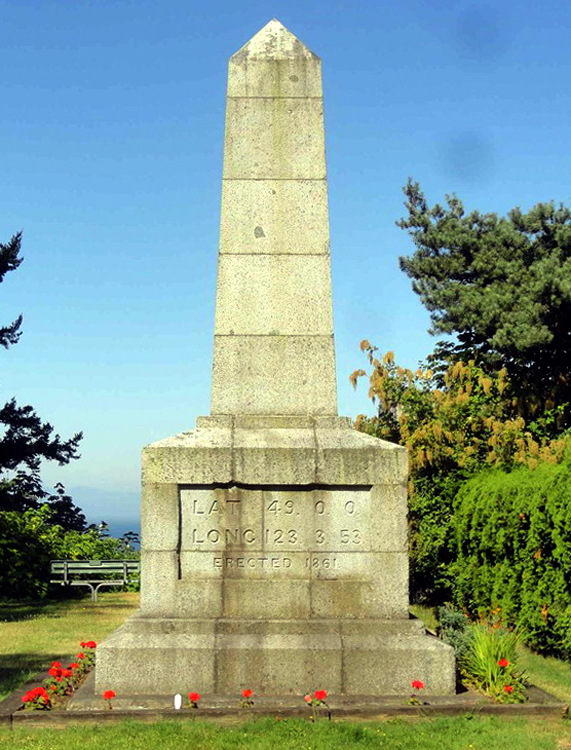 Point Roberts was named in 1792 by Captain George Vancouver after his longtime friend Captain Henry Roberts. It was settled by Icelanders, who scraped out a living by fishing and farming, although the soil is some of the worst in Canada. Later, canneries opened up to process the haul of fish from traps set into shallow Boundary Bay. 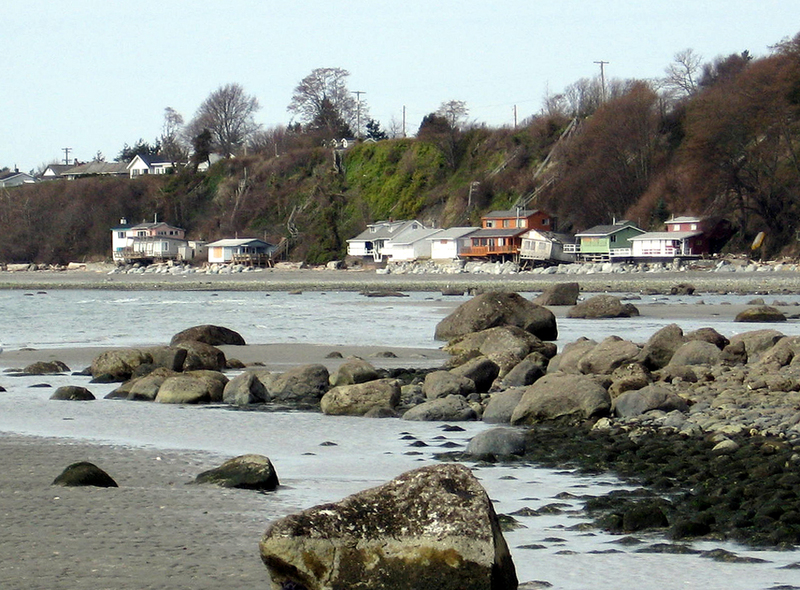 Point Roberts reached the apogee of its fame during Prohibition, when the community was a hotbed of rumrunning. Tables turned after the repeal of the Volstead Act, when Canadians began to come to Point Roberts on Sundays to drink. At the time, it was illegal to serve alcohol on Sundays in Canada. A thriving saloon business began that survives to this day, with the addition of bingo, although the bars advertise it as ”gambling,” because bingo just doesn’t sound illicit enough. Things begin hopping in Point Roberts in the summer, when vacationers from Vancouver swarm the place, quadrupling the population. A marina is the central attraction. But hidden in the northwest corner of the enclave, along Roosevelt Way, is a monument of historical importance: the westernmost boundary marker along the 49th Parallel. It is a worn, lichen-crusted stone obelisk marking latitude 49 degrees north and longitude 123 degrees, 3 minutes and 53 seconds west. The surveyors who fixed the border started from this point and worked their way east. 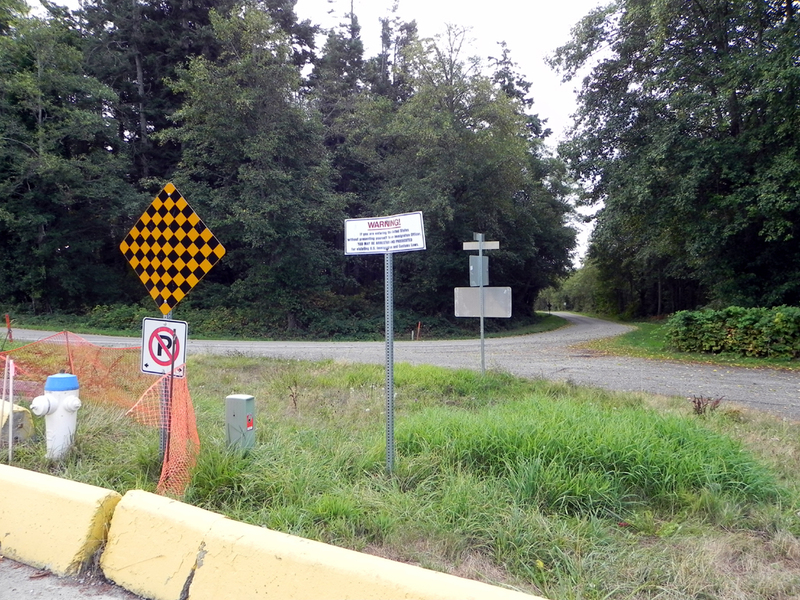 Small customs offices are on both sides of the border on Tyee Drive. The Canadian office is newer and slightly larger. But the United States, not to be outdone, has built a new $5 million facility to replace the old one. In the basement is a jail, needed to hold criminals until the boat can take them to the mainland. This brings to an end the series of entries for “California and the West,” chronicling the drive from Tijuana, Mexico to Vancouver, Canada. Love small towns’ police blotters! I still remember an item in the weekly Cuba (NY) Patriot-Free Press about a man who was reported for throwing his tree trimmings into a neighbor’s backyard. Reading such items always makes me daydream about moving back to my hometown.